Firstly a little history might be in order as Kirchen and De Lone can both trace their careers back to the late 60’s. Bill Kirchen co-founded Commander Cody and his Lost Planet Airmen whose brand of country-rock should probably be considered one of the forefathers of the Americana genre. Austin De Lone would get his first break many miles from home when his band Eggs Over Easy inadvertently launching the Pub Rock genre around the London hostelries of the early 70’s. In an almost two year stint of UK shows the band would influence the likes of Elvis Costello and Nick Lowe, both artists that would reappear in the Kirchen / De Lone story. The duo would cross musical paths regularly most notable writing together as The Moonlighters. That bunch of tunes, written with Rockpile (the Dave Edmunds / Nick Lowe / Billy Bremner act) in mind, would eventually be released years later with Nick Lowe producing under The Moonlighters banner. This would lead to both having stints working with Lowe and in Elvis Costello’s band. Kirchen is based in Austin, Texas while De Lone calls the San Francisco Bay area home but their mutual ties to the UK would lead to the recording of ‘Transatlanticana’ in Proper’s Specific Sound studios after a 2015 UK tour with further recording in Austin and San Francisco. For the recordings in London Paul ‘Bassman’ Riley (Chilli Willi and the Red Hot Peppers) and Malcolm Mills would form the rhythm section while bass player David Carroll (Ray Price, Billy Joe Shaver) and drummer Rick Richards (Joe Walsh, Ray Wylie Hubbard) would do likewise for the USA sessions and needless to say it’d be rude not to invite a few guests along for the ride. The album opens with a tribute to Merle Haggard and the Bakersfield country scene which influenced so many of the Americana acts of today. The song co-written by Kirchen and long-time collaborator Blackie Farrell (Commander Cody / Asleep At The Wheel) is a terrific slice of whimsy with plenty of twangy guitar lines and features a classic line or three “Digging up bones like Sherlock Holmes we’re the hounds of the Bakersfield” and “I don’t wanna brag, but look out Hag, here comes another stranger” is a clever play on Merle and his 60’s backing band. ‘Wine, Wine, Wine (do your stuff)’ is a new recording of a track from the early days of Commander Cody and features, pedal steel great, Bobby Black trading licks with Kirchen. This is the sort of country music I grew up with and brings back many a good memory of the records I heard growing up. De Lone takes over the song writing and lead vocal duties for ‘Let’s Rock’ which lives up to its title with a terrific rockin’ groove, sprightly guitar work and piano to the fore. ‘Oxblood’ is even better with some ace piano work from De Lone and incendiary guitar playing from Kirchen and Gurf Morlix on a tune that finds Kirchen sharing vocals with top Texas songwriter Butch Hancock. If this one doesn’t get your feet tapping, you’d better check your pulse. Bill Kirchen & Austin De Lone pic by Andrea Legge. The record then steps off the gas for a gentle run through of the old Jimmy Donley tune ‘Think It Over’ which features nice organ work from De Lone. ‘Think It Over’ is really nice but next up the band ease into the slow blues of ‘Losing Hand’ popularised by Ray Charles in 1957, “My personal choice for the greatest album of all time” claimed Austin De Lone. When you make a statement like that you’d better do the song justice, we needn’t have worried as De Lone does the track proud with fine piano and organ work while Kirchen lives up to that “Titan of the Telecaster” tag with an effortless display of feel, and above all, gorgeous tone. This is a real highlight and is fast becoming my favourite thing of the moment. The relaxed mid-section of the album concludes with a soulful take on ‘Warm and Tender Love’ which stands comparison to the Percy Sledge version, more especially nice guitar work here. ‘All Tore Up’ kicks things back up into high gear with an infectious pacey romp, all rollin’ piano and gang harmony vocals which demonstrates De Lone’s ability to write a tune that is totally timeless and sits perfectly with many of the more familiar songs covered here. De Lone also wrote ‘Already Walkin’ with his daughter Caroline, who adds harmony vocals, while Riley and Mills sound especially fine here as De Lone reflects on his memories and mortality. Things take a dark turn with the solemn ‘Back in the Day’ written by Bill Kirchen’s wife Louise. The song references the civil rights struggles of 60’s America, most notably the Berkeley riots and Gurf Morlix again returns to add dark, threatening guitar licks to proceedings. ‘Back in the Day’ has a marked Blue Oyster Cult vibe…not an act you expected to see name checked in this review I’m sure. The Bill Kirchen / Blackie Farrell writing team is back together for ‘Somebody’s Going Home’ which finds De Lone switching to electric piano, while the gospel feel is accentuated by the use of harmony vocals with Louise Kirchen and bassist Sarah Brown prominent. The original running order of the album concludes with a boisterous version of the Dylan standard ‘The Times They Are A Changin’’ which is given a welcome new lease of life with plenty of room for Kirchen, Morlix and De Lone to trade musical blows. As I mentioned earlier this UK release features two bonus tracks,which sit perfectly with the rest of the material, a De Lone original ‘No Need for Knocking’ on which Kirchen gets to practise his whistling, while an old Commander Cody song ‘Smoke! Smoke! Smoke that cigarette’ perfectly ends things on a humorous note. 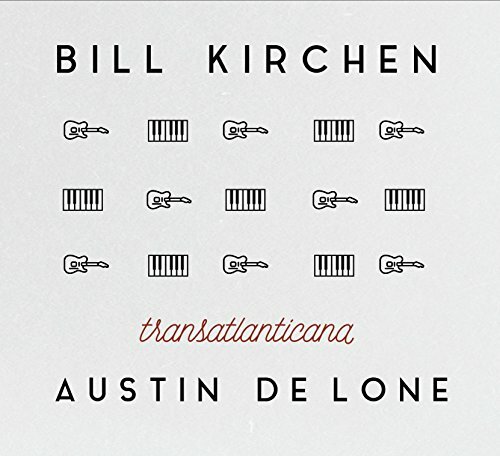 Bill Kirchen and Austin De Lone have in ‘Transatlanticana’ made a very fine record that features a great mix of songs, played with style and panache by veteran musicians, that really is a joy.